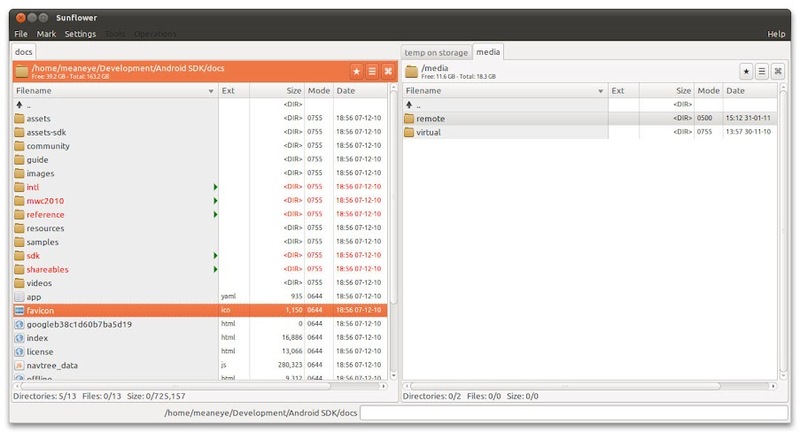 Sunflower is a small and highly customizable twin-panel file manager for Linux with support for plugins. It is intended to be an easy-to-use and powerful file manager that seamlessly integrates into the GNOME desktop environment. Getting me some of that! This will sound weird, but I really miss the days when I used Worker as file manager. Back then it look sleek with its flat colours, and it could be configured to do exactly what I wanted to do. But over time my demands grew, and Ubuntu seemed to take care of most of these out of the box, so I forgot about Worker. How different is this from using the GNOME file manager and pressing the F3 key? I could not access Window’s volumes. If they are mounted there should be no problem with access as we rely on system libraries to do that. If you, however, tried to mount volume from volume manager, that’s expected behavior as Mount Manager is still not completed and still being worked on. How increase the font size ?